Renting an inflatable or concession item that requires power but don’t have power outlets available? 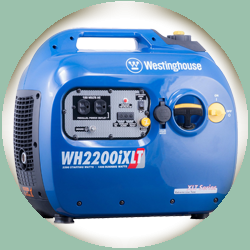 This 2200 peak watt generator, with 1800 running watts provides enough power to run 1 moonbounce blower, or 1 cotton candy machine, or 1 snocone machine, for up to 8 hours. Generator rental includes a full tank of gas.